Frume Sarah is not from the feminists. 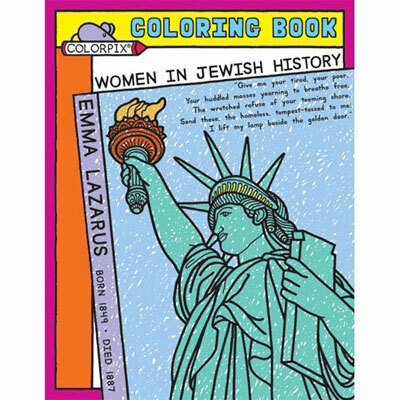 So what possessed me to purchase a copy of a colouring book entitled, Women in Jewish History, is a complete mystery. But purchase it I did and the next thing I know…Poppyseed has it in her hot little hands and is reading about an amazing and varied group of women. This nothing colouring book has inspired conversations about selflessness. Bravery. Wisdom. Courage. And in unexpected ways. Poppyseed was enthralled with the bravery of the non-Jewish friends who went to great lengths to keep Anne Frank and the other occupants of the Secret Annex safe for nearly two years. Though equally impressed with Hannah Senesh’s bravery, she was particularly touched by the selflessness of non-Jews saving Jews. Rather than set out with any agenda to teach my children about admirable Jewish figures, it turns out that by leaving this colouring book in Poppyseed’s sight was enough to get the lesson started. I mean…who can resist a colouring book? What a great teachable moment for you and your daughter. Enjoy! Thanks. It was completely unplanned 😉 Which is the BEST kind of teachable moment. That’s excellent! Can’t wait for my daughter to be old enough to “get” stuff like that. Very cool! I know. It’s been hard not to wish away the years, knowing that there are so many neat things I want to do with Poppyseed. How nice! Where did you find such a great coloring book? Local Judaica store (http://www.goldendreidle.com/). They have been so wonderful to me and my family over the years. My granddaughter’s interest in this book has caused me to look up Hannah G. Solomon. Her Bubbe is member of NCJW; I’m happy to have learned about the founder of this fine organization. What a great coloring book! It really is. And it’s started some ongoing conversations that are just wonderful.